Five exclamation marks is never too many to describe my excitement at getting back into the blogging routine. Winter has been wintery (although not as bad as some years) and what with Christmas, New Year and noroviruses things went very quiet at Kailzie over December and January. But we are back and ready for action. In my infrequent visits out to Kailzie over the winter I have not exactly been overwhelmed with wildlife although the goosanders on the Tweed are always a lovely sight. Some snowy walks through Kailzie Gardens and the surrounding Forestry Commission Forests allowed me to take some questionable quality photos of the scenery and the signs of bird and mammal footprints in the snow. Hopefully the spring time will prove more fruitful. The species on my dream list for this year are the following: kingfisher, otter and sand martin. If anyone knows where I can spot any of these species around the Tweed then do let me know where and when and I will be there with my trusty camera to get beautiful pictures of tails leaving the frame and my own shadow cast over the whole photo. This year is also the year I am determined to take some good wildlife photos, in case this was not apparant. offering bushcraft courses at Glenlude, making fun wildlife films with families, buzzing around our brand new giant bee hive (more on that soon), photographing wildlife along the tweed, banging our heads against the wall at the Big Kailzie Wildlife Quiz, and eating a colossal amount of biscuits and cake. To start off our this 2013, Year of Natural Scotland (or YONS as some people have been calling it, which I only just worked out. For ages I thought they were just referring to boring things they didnt want to elaborate on) events programme we are putting on our best Brian Cox voices and will be hosting an evening of star gazing at Kailzie on Friday 15th March at 7.30pm. Never mind Brian, we have Dr Tom Johnston from the Ancrum Astronomy Club coming to teach is about what we can see in the skies above Peebles with his “Beginners Guide to the Night Sky”. It looks like it is going to be a really interesting and inspiring night and I recommend you all come along. With so much going on at Kailzie this blog is going to need to be updated pretty regularly so I have stocked up on a good supply of moffat toffee to keep those sugar hits coming! Posted by kailzie on February 19, 2013 in Uncategorized. First I would like to thank everyone who braved the first onslaught of winter on Friday the 26th October and came to the Hedgehog and Hibernation talk by Alison Person. I think everyone now has a better understanding of how to look after hogs in their gardens, but I am sure I speak for everyone when I say that the highlight of the evening was getting to meet this little critter in this photo. His name is Tweed and he sat very obligingly in Alisons hands for most of the evening. Presumably he knows all there is is to know about hedgehogs, or maybe he had just heard the talk before, but he was very chilled out. On a personal note I very much enjoyed the moment that Alison put him on the ground and he took off along the skirting boards of the centre in search of food, freedom or ladies. None of which he found sadly, but his little dash might have helped clean up some of the cobwebs and dust that decorates the centre. Every little helps. Next on the KLAWED agenda is the small matter of our BIG KAILZIE WILDLIFE QUIZ on Friday the 16th of November. It is so big it needs capital letters to fully convey it’s bigness. With this quiz we will weed out the boys from the men, who knows their lesser spotted woodpeckers from their greater spotted woodpeckers, and who has managed to get mobile phone reception in the osprey centre. With regards to the latter we would be lucky to actually be respresented within a square on an ordnance survey map in that centre. It is like the Bermuda Triangle of Scotland. The bugs that live inside the centre have great trouble getting credit cards as their postcode is not recognised. The mice that have been sneaking in to eat the biscuits and toilet roll (random but yes they like it) do not have their names on the electorol roll. So mobile phones will be useless! I do love a pub quiz, as I am sure many of you do too. But be warned, this is not your average quiz. As it is at Kailzie it will be quirky and although it is a wildlife quiz, even Attenborough would be hard pushed to get 100%. Wildlife knowledge will help, but it is not essential. In addition, unlike a pub quiz there will be no bar as soberness will be required to concentrate on the task at hand, and also to drive you back home afterwards. There will be refeshments provided though and nibbles a plenty to keep the brain ticking over. The winning team will be awarded with the first ever BIG KAILZIE WILDLIFE QUIZ trophy, which will be a delightful centrepiece for any office, livingroom or rabbit hutch. Entries for the quiz can be made via email to me at kailzieofficer@gmail.com or by calling 07792033331. It costs £10 to enter a team and we allow 4 people maximum on a team (partly due to tiny tables!). So off you go to get swatting up, although with the natural world being quite a large subject I am not sure where you would start. Hope to see you all soon at the BIG KAILZIE WILDLIFE QUIZ 2012! Posted by kailzie on November 6, 2012 in Uncategorized. I am delighted to confirm that we will be joined by 2 fantastic little hedgehogs on Friday 26th October for our Hedgehog and Hibernation evening at Kailzie (see previous post). What conversation they will offer remains to be seen, but what they might lack in chat they will more than make up for in cuteness and sniffing! Hope to see you all at Kailzie, 7.00pm on Friday 26th Oct! Posted by kailzie on October 22, 2012 in Uncategorized. 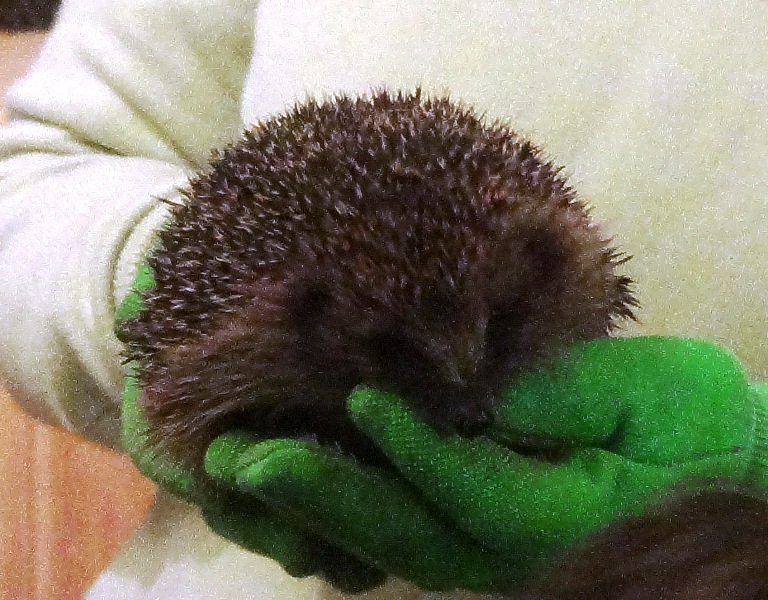 We are having an evening devoted to out prickly little garden friends this Friday the 26th October! Alison Pearson from Border Beasties will be on hand to tell you everything you need to know about looking out for hedgehogs in your garden or town. Refeshments will be available, and you can make your own hedgehog cupcake! We will hopefully have a couple of spikey star guests for you to get to know too! Posted by kailzie on October 20, 2012 in Uncategorized. A bug hunt with a difference! use ours and learn how to edit your footage. Come and make your own short film featuring the wildlife at Kailzie. Our Project Officer will show you the best places to find birds, bugs and mice and help you identify what you see! Bring your own camera with filming capabilities or use ours and learn how to edit your footage. Please let me know if you would like to bring your own camera as we have limited equipment available. Hope to see you all at Kailzie soon for some wildlife filming fun! Posted by kailzie on October 5, 2012 in Uncategorized. Now that the ospreys have set off for their exotic winter holidays I am left with a dilemma. What on earth can we use our Nature and Osprey Viewing Centre for. So much money and work was put into installing HD camera equipment to show wonderful live footage of our summer wildlife, including the ospreys and also the sometimes very gruesome herons. Osprey cam must remain where it is as disturbance of the nest needs to be kept minimal at all times of the year. But the heron camera? Right now it shows a lovely view of an empty nest and on especially lucky days we do see some flies negotiating their way around it. But this is no good to show to the public! Ideally we need a good puppeteer to come and reproduce the drama through the nesting season, someone that can sit tight up a tree for a whole afternoon and control 3 or 4 puppets at a time. If anyone would like to volunteer for this please let me know. Maybe we could drag Rod Hull and Keith Harris over to Kailzie and Orville and Emu could reinact the squabbling of the chicks in the nest. It seemed a full proof plan until I remembered that Rod Hull was no longer with us. What on earth can we film during Autumn? River cam is still in action, catching the finest wildlife the Tweed offers us, including herons, the odd jackdaw, and a steady stream of canoeists. Will we ever catch a glimpse of the star prize…. an otter? Perhaps not, but we know that otter are around. Residents on the estate see them all the time and some even tell us they hear them at night. So its a case of remaining patient, ever the wildlife watchers job. Meadow cam has been reinstated having spent the summer in camera hospital exchanging sob stories with badly wired nest box cameras and dreaming of the day the sheep will once again roam underneath it. Well dream no more meadow cam! You are back and ready for action. Meadow cam is supposed to focus on a wet marshy corner of a field where a variety of birds come to feed in autumn and winter. When I turned on the monitor on Wednesday I was very excited to see a lonesome lapwing sifting through the vegetation, and I zoomed right in and watched it for a good 15 minutes. Hopefully we will have loads of lapwing soon! A number of small cameras will be redundant over autumn and winter as they were positioned in small bird nesting boxes. A bit of repositioning should allow us to instead direct them onto bird feeders. Just this week I swivelled one to look at a basic nut feeder and it is great to watch the nuthatch and great spotter woodpeckers alternate feeding rights. Wood peckers are particularly nervous and flightly fellows and although they come to the bird table outside the main window they tend to whoosh off at any sign of movement. This camera will allow us to view them in a little more detail and without the poor birds becoming nervous wrecks. And finally we have mouse cam. This is a first for the centre and has the potential to be fantastic or a massive failure! I am going to have to keep you posted on the progress of this as it is in its infancy stages. The nocturnal habits of mice and voles could also mean that this is not a particularly exciting day time camera but hopefully we can record the nightly goings-on within the mouse feeding box and show this footage. All I can promise is that it is going to be very very furry. The centre will open on Sunday the 30th Sept and will be open for all Sundays during October and November. Please pop down and visit us to learn more about the project and to enjoy watching the wildlife in the surrounding area from the comfort of our centre. Or if you fancy volunteering with us then don’t hesitate to contact me on kailzieofficer@gmail.com. Hope to see you all at Kailzie soon! Posted by kailzie on September 21, 2012 in Uncategorized. People keep telling me that we have a deer problem in Scotland. But I tell you what the problem is… it’s that I can’t find any deer! This morning was the start of my deer quest. My quest to find the perfect spot to film deer for our Wildlife Filming and Editing Worshops later this year. This spot ideally will be a forest glade where the morning sun filters through the canopy leaves giving just enough light to form an ethereal backdrop for the deer to come and drink, feed, play, groom, mate and all the things that deer do. Surely such a spot exists in the forests surrounding Peebles? My early morning excursion didn’t quite match this. We are most likely to see deer first thing in the morning or at dusk. But I am starting to realise that my idea of first thing in the morning and a deers definition of first thing in the morning may differ considerably. For a start I have some doubts that the roe deer of Tweed Valley spent Thursday evening eating curry and drinking a couple of glasses of rose. I also doubt they got sidetracked by an interesting story about Cheryl Cole in a magazine and went to bed quite late. And if they did remember to set their alarms for 5.30am they probably didn’t press snooze every ten minutes for an hour. You get the idea with where I am going with this. By the time I reached Cadmuir forest at 7.15am I think that the good deer had already been up, had their breakfast, brushed their teeth and straightened their ties ready for a days work and were long out the door! Either that or the persistent drizzle caused them to have an extra long lie this morning and in fact I was the only sole to be found at that time enduring a slow painful soak as I trudged through the undergrowth. So where did I go wrong? To start with I think that 7.15 am is not considered early in the world of the mammal (unless you are a sloth, but given that they are nocturnal they possibly are awake as the first rays of morning sun beam through). 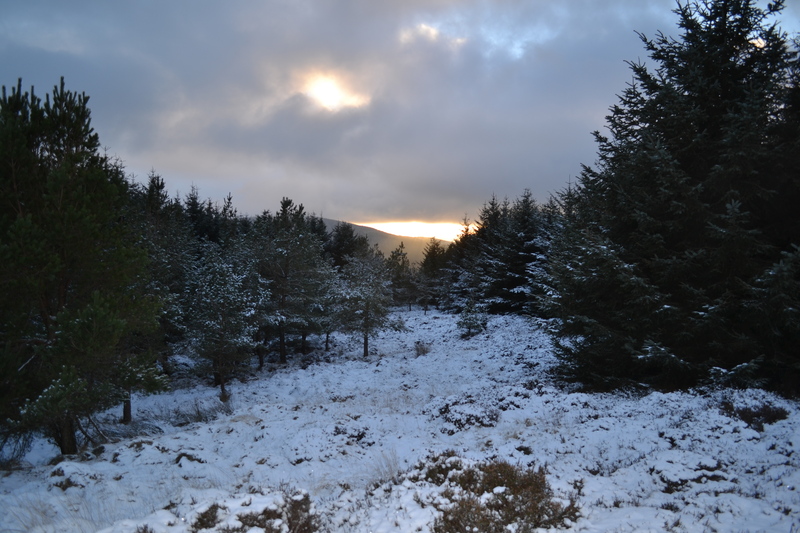 Secondly, Cadmuir forest is our smallest Forestry Commission forest in the Tweed Valley. Next time I think I need to choose a larger forest more likely to house more deer, and perhaps an early night with some Ovaltine Light in order to wake with a 5am alarm might serve me better. There may have been no deer, but I was not completely alone in my later-than-hoped morning wanderings. I am sure every wren in the forest was cursing me every step of my walk. Nothing you do is ever good enough for a wren. They “tsssk” at you disapprovingly with every move you make. I always wondered if it was just me. Maybe they didn’t like the way I walked, or wore my hair, or zipped up my coat, or carried my rucksack. I have never heard a postive or encouraging tweet out of a wrens mouth! Should I take offence? I bet the wrens had seen a deer. I couldn’t help but think I deserved their abuse this morning. If you happen to know of some good spots to find deer then please do let me know! Determined to find success I will be choosing a different forest to continue my mission next week. But some hints and tips on good spots would be very much appreciated! I would also like to hear if you have had any trouble with wrens undermining you and knocking your confidence. In the meantime I will try and see if there are any support groups out there to lend a hand with these hurt feelings I am experiencing. Hope to see you all at Kailzie soon with various interpretations of what “early morning” means! Posted by kailzie on September 8, 2012 in Uncategorized. Do you fancy getting involved with the KLAWED project? Would you like to share your knowledge and passion for wildlife with others? We are looking for volunteers to help us by becoming wildlife and information guides in our Naure Viewing Centre. The centre will be open on Sundays from October onwards and we need a cracking team of nature lovers to pass on their enthusiasm and let visitors know what we can see in the local area. There is no minimum commitment, but if you feel you could spare 3 or 4 hours one Sunday every month or two then that would be perfect! No technical skills or knowledge is required as we like to keep things as user friendly as possible. But full training will be given. However a friendly nature and a welcoming smile are essential! Hope to see you soon at Kailzie! Posted by kailzie on September 5, 2012 in Uncategorized. On realising last week that I have worn a bodywarmer every single day since taking up my post here at Kailzie I decided to see if I could research the history of the garment, also known as a gillet or a vest. Typing in “history of the body warmer” into Google gets you nowhere though. Instead I found websites explaining what a “warm-body” is, and for those of you interested it is apparently someone who you can rely on not to die. As much as I love my bodywarmers I am not sure they actually keep imminent death at bay, although as I write this I am alive and well so maybe there is more to this than meets the eye. I find the British summer time cold. And as I sat in the Osprey and Wildlife Viewing Centre last week while the rain lashed down outside and the wind blew in the door I felt glad of my bodywarmer. But would it be enough? I began to think that it wouldn’t. We have a lovely wood burning stove in the Osprey and Wildlife Viewing Centre. Or so I had heard. Despite my best efforts I had never managed to burn anything more than a couple of pieces of newspaper in it. Normally an hour of effort resulted in nothing more than my hands covered in ash and a smoky smell clinging firmly to my hair. No flames, no fire, no cosy heat. Now at this point I would like to point out that I am not a totally sissy. I spent my childhood in the girl guides making fires, camping and eating and toileting outside. That was my childhood. However I have found that the best thing about being an adult is that you don’t have to do any of these things if you don’t want to. And so I chose a life of luxury, of electricity, and of indoor plumbing. I guess I have forgotten these basic skills. But luckily the Tweed Valley Osprey volunteers are not nearly so hapless. Arthur took pity upon me and decided to share the secrets of mans red flower. He has effectively been the Mowgli to my King Louie (although not the best analogy since Mowgli didn’t know how to make fire either having grown up lazing around on a bears belly rather than in the company of humans). For those of you who do not get the Jungle Book reference, Arthur has taught me how to make a fire. In case you are wondering what is the point of all this and why have I written a blog about my inability to do the most primitive and basic of human functions (keep myself warm), then please bear with me. Having a warm Osprey and Wildlife Viewing Centre is crucial for our up and coming events and opening hours of the centre. The centre is going to close for September to make way for some changes. Now that the ospreys have fledged and will be heading off to sunnier climates soon, we must focus our attention on other sources of wildlife viewing fun over the autumn and winter. When we re-open in a few weeks’ time the centre will act as a cosy and welcoming retreat for walkers, nature lovers and visitors to Kailzie. We will have cameras on a variety of different species and visitors can while away an autumn afternoon relaxing in our centre with a hot drink watching wildlife from the comfort of their seats. So now you see why getting the fire going is such a big deal. I have over used the word “cosy” in this blog entry purely because I want to emphasise that this is what the centre will be when we re-open (and not at all because I couldn’t think of another word to use instead). I am confident it will be so cosy that I don’t even need my bodywarmer. Hope to see you all at Kailzie soon toasting marshmallows* and singing camp fire songs** while watching some Tweed Valley wildlife. Posted by kailzie on September 3, 2012 in Uncategorized. Calling all budding “Simon Kings”!!! Here at Kailzie we believe that the best way to learn and enjoy wildlife is to get out there and experience it for yourself. We will be running wildlife filming and photography workshops with the aim of doing exactly this! Over the next few months in the lead up to the dreaded winter you can come and make your own wildlife films with us. You can either use your own camera or use the equipment provided by the KLAWED project. Our day workshops will allow you to film, edit and produce your own film to share with your friends and family. To get you all in the mood for wildlife filming why not come along to our Wildlife Filming Taster Day on Sunday August 26th at the Wildlife Viewing Centre at Kailzie. This event will operate on a “drop-in” basis from 10am until 4pm. Come and learn about the courses we are offering and have a go with the filming and editing equipment. Posted by kailzie on August 21, 2012 in Uncategorized.